You likely know Johann Wolfgang von Goethe better simply as Goethe, if you know him at all. Despite being widely regarded as one of the greatest writers of all-time, right up there with William Shakespeare, he doesn't get nearly as much recognition as Billy does. Goethe needs better PR. His good name certainly hasn't been forgotten in Germany. He's all over Frankfurt, the city of his birth, immortalized in statues and monuments throughout the city. Here's one I visited in downtown Frankfurt earlier today. Faust is Goethe's most famous work, but he also wrote The Sorrows of Young Werther, The Alder King, Iphigenia in Tauris, The Sorcerer's Apprentice and Elective Affinities. The man was prolific. His body of work includes epic and lyric poetry written in a variety of metres and styles; prose and verse dramas; memoirs; an autobiography; literary and aesthetic criticism; treatises on botany, anatomy, and colour; and four novels. In addition, numerous literary and scientific fragments, and more than 10,000 letters written by him are extant, as are nearly 3,000 drawings. 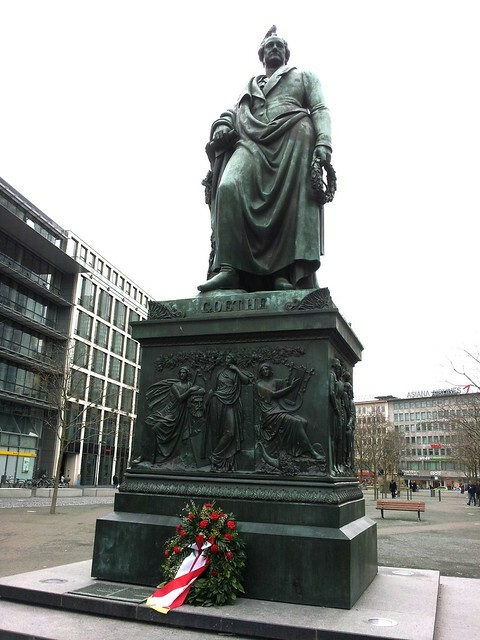 Tip a glass for Goethe, the forgotten genius, who is deservedly celebrated throughout Frankfurt, Germany. Is he a nice guy? Did you get to meet him? He's a bit of a stoner. It's amazing because his surname Goethe reminded me of Gotye - and how Goethe really is just somebody that the Germans used to know!